Is it just me or have we been waiting forever for the last book in The Lunar Chronicles series? I need this book in my life! I needed back in February when we all thought it was going to be released instead of Fairest. 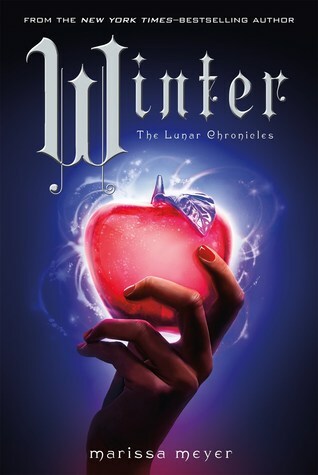 I've been dying to learn more about Princess Winter as well as see what shenanigans our favorite group of rebel misfits get up to in this book. Especially after what happened at the end of the last book! I have absolutely no idea where this story is going to go and that absolutely delights me and downright terrifies me. Marissa Meyer has shown that she doesn't pull her punches when it comes to her characters in the previous books and I'm nervous for all of my darlings! The best thing I've learned about this book so far? It's going to be 800 pages long! That kind of makes up for the fact that I will have waited twenty-one months for this book by the time I get my hands on it. Goldlox's Greatest Hits is our monthly wrap up feature. We'll recap our favorite books we've read this month and show you some of our favorite posts that you might have missed, as well as what's coming up next on Goldilox and the Three Weres. The feature's getting a bit of a makeover this month, so let us know what you think. 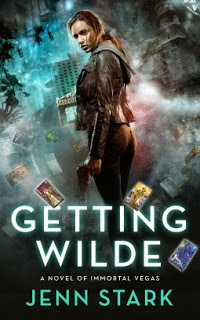 Rose Red says Jenn Stark's Immortal Vegas series just became an auto-buy. She gave the first book, Getting Wilde, 4 stars. 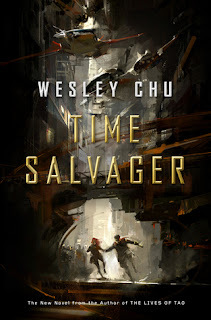 She called Time Salvager by Wesley Chu "the sci-fi/dystopian/thriller mashup that I never knew I wanted" and gave it 4.5 stars. 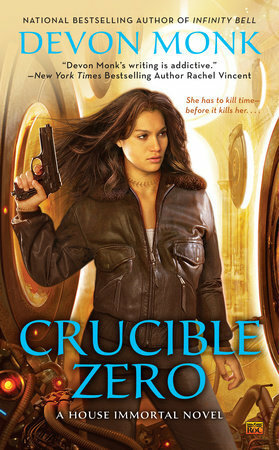 Gretl gave the House Immortal series finale, Crucible Zero by Devon Monk, 4.5 stars. This month Read This F-ing Book posts featured Ilona Andrews's Kate Daniels series, Sorcerer to the Crown by Zen Cho, and the Damar series by Robin McKinley. 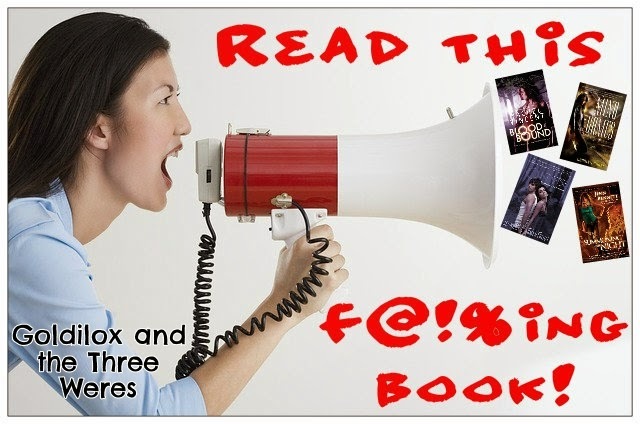 We also just celebrated the third anniversary of Read This F-ing Book. Check out our anniversary post! The giveaway is open until October 5. And we brought back Waiting on Wednesday recently. This month's picks are Soundless, Thinning the Herd, and The Aeronaut's Windlass. Some months our reading, and therefore reviewing, gets completely derailed by a Netflix binge. And a lot of times my binges can be blamed on someone raving about a show on social media. So this month I decided to pay it forward. I'm totally taking credit for the fact that my co-bloggers are both obsessed with Killjoys! I mentioned it in my Sell Me on SciFi post and now it's everywhere. It's recently been featured on Heroes and Heartbreakers and The Mary Sue. Yup, that was all because of me ;) This one's not on Netflix yet, so check On Demand, SyFy.com or iTunes. A couple of my favorite authors loved Justified. I got Amazon Prime last month so I finally got to watch it. I love Raylan Givens! And Walton Goggins is always amazing. I've even added the books that the show is based on to my wish list. While I'm waiting for season 6 to start streaming, I decided to get my lawman fix with Longmire on Netflix. I didn't realize it was possible to be even more rural than Harlan, Kentucky, but Durant, Wyoming manages it. Sheriff Longmire's county borders a Cheyenne reservation, and the Native American politics and culture in the show make it unique among crime dramas. You might remember me raving about Carolyn Crane's Associates series in a few different posts. I recently got a postcard from one of the Associates! After I figured out that I didn't have a stalker, because I totally forgot I signed up for these, I decided this is the coolest thing ever. It's almost time for Goldilox and the Three Scares again! The event starts at the end of the month. We're lining up authors and giveaways for you as we speak. James is a chronman, undertaking missions into Earth's past to recover resources and treasure without altering the timeline. The laws governing use of time travel are absolute; break any one of them and, one way or another, your life is over. Most chronmen never reach old age; the stress of each jump through time, compounded by the risk to themselves and to the future, means that many chronmen rapidly reach their breaking point, and James Griffin-Mars is nearing his. On a final mission that is to secure his retirement, James meets Elise Kim, an intriguing scientist from a previous century, who is fated to die during the destruction of an oceanic rig. Against his training and his common sense, and in violation of the chronmen’s highest law, James brings Elise back to the future with him, saving her life, but turning them both into fugitives. Remaining free means losing themselves in the wild and poisonous wastes of Earth, somehow finding allies, and perhaps discovering what hope may yet remain for humanity's home world. I’ve been a fan of Wesley Chu’s books since I first read his The Lives of Tao. Time Salvager definitely has a darker, more gritty vibe than the Tao books. The future is not the nice, shiny golden age that we all expect. Humanity is barely hanging on. They may be able to travel through space and they’ve colonized many planets and moons, but they’ve lost a lot of their technological advancement because of wars and other things. Earth, itself, is a toxic dump that everyone with any means left a long time ago. In order for humanity to survive, they have to send people back in time to salvage resources they need. It is not a great time to live in. This book was the sci-fi/dystopian/thriller mashup that I never knew I wanted. I loved it! It had everything I love about science fiction! What enthralled me from the start was the dark and depressing take on time travel. I don’t know about you but I’ve gotten sick of time travel books and movies that emphasize the time paradox where you go back in time and do something that results in you never being born or completely altering history. That’s not how it is here. Things involving time travel in this book get pretty timey-wimey really quickly: time ripples, time lag, preserving the chronostream. But there are rules. Very strict rules that allows Chu to ignore most of this because the Time Laws are designed to avoid making ripples in the timeline. They only take resources that would be destroyed in events soon after salvage, so anything missing would automatically be assumed that it was destroyed in whatever calamity that had occurred. The most important rule though is to never bring anyone from the past back with you. Sometimes ripples can’t be avoided. You accidentally save someone who was supposed to die in World War 2, and they go on to have a family? No matter, a car crash will kill them all, so their descendants don’t exist and so can’t contribute to change. You get rogue chronmen that don’t want to go back to their time so they hide in other periods. Most of the time the timeline can heal itself which sets things right. Other times, Chronocom sends in an auditor to correct things. The timeline is something of a fluid thing and subject to change, but capable of being repaired. I really enjoyed the way Chu handled time travel. I also liked how he handled the mental health of the chronmen. They all suffer from differing levels of PTSD. It makes so much sense. These time travelers are repeatedly sent back in time to major disasters to salvage things but to not interfere with the events. Watching that much death and destruction has to wear on a person. Not to mention, how jarring it would have to be having to travel back to better times only to return to a pretty crappy present. It makes sense for the chronmen to be suffering mentally and emotionally. It’s a rough lifestyle. One thing I’ve come to appreciate about Chu’s work is that he always has a cast of diverse and complex characters to lead the story. It’s always a treat to read his books because he writes such realistic characters. They feel like proper and real people and not just stereotypes or caricatures. James Griffin-Mars is a complicated lead. He’s not always a great guy and he does some stupid things while frequently being selfish and surly. He was so unlike most SFF protagonists I’ve read. I’ll be honest, I didn’t like him at first but as the book progressed he grew on me. Even with his gruff manner, he was quite a refreshing character with how different he was from most sci-fi protagonists. Elise, on the other hand, has an air of innocence and hope to her. It fit her well because she is someone who believes that what she’s doing can change and improve the world. She’s optimistic and that’s a trait that humanity has lost over the centuries. I love that while she has hope, she’s not naive. She understands just how bad off things are in James’s time when compared to hers. Despite what had to be a shocking transition, she adapts to everything while staying the person she was in her time. I will say that one of my favorite characters overall in this book turned out to be Grace, the Mother of Time, and that was not something I expected when I started reading. She was absolutely fascinating! 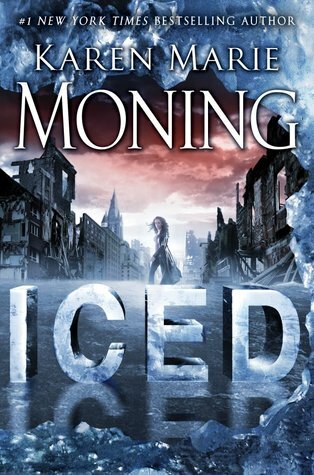 I loved this book and I’m really looking forward to getting my hands on the sequel. 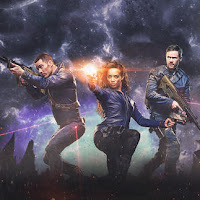 Time Salvager does a fantastic job setting up for a fast-paced sci-fi thriller series that is brimming with potential and you really can’t ask for much more in a first book. GAH! I need book two! May 2016 is so far away! I need to know what happens! I've never read a Jim Butcher book. I know. I love urban fantasy but yet I haven't picked any of the Dresden Files books. I am kind of ashamed of that. I do have have the first nine books scattered throughout Mount TBR. I just need to read them. I decided earlier this year that The Aeronaut's Windlass will be my first Jim Butcher book and I'm going to stick to that decision. 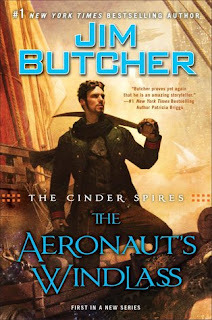 It's the start of a new series plus it's a steampunk book with airships! It sounds like a great starting place to me! I don't know much about this book other than that but I'm so excited to read it! So many of my blogger friends who got ARCs have loved it! I need this book in my hands ASAP! 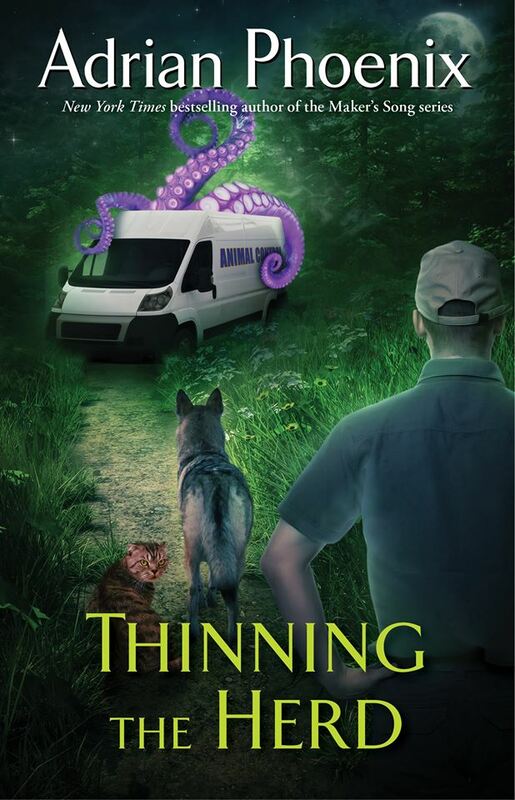 I hear it even has a talking cat in it.